For a reporter, or even a talk-radio host, when a political operative says something is a “distraction,” then that’s the exact moment to start asking questions. Carno: It’s just been this series of distractions, with the Planned Parenthood mail pieces being the latest distraction. This isn’t about abortion. Supreme Court Justices are not decided in Denver. There’s nothing that’s going to happen here that’s going to harm women. And as a woman…stop trying to manipulate women by saying in 2013 all of these terrible things are going to happen, and they are just not going to. As I’ve discussed a couple times recently, abortion issues are not a distraction in state politics. Ask a woman just across the CO border in Utah (and 11 other states), if she thinks it’s a pesky distraction to be required, before she can obtain an abortion, to get counseling on the ability of a fetus to feel pain. Read about distractive state abortion laws here and proposed laws in Colorado here. Carno herself helps run the Colorado Women’s Alliance, whose mission includes supporting “research, education and advocacy in areas of concern to women voters.” Since when is reproductive health, including abortion, not a concern to women? Still, Carno feels so strongly about eliminating the abortion distraction from the CO Springs recall election that she and KVOR talk-show host Jeff Crank are pressuring CO Springs TV stations to stop running ads stating, accurately, that Republican recall candidate Bernie Herpin supports the personhood “plan” to codify life as beginning at conception and thus outlawing all abortion and common forms of birth control. One TV station manager has declined to withdraw the ads, and the others aren’t responding, suggesting they agree that the ads are factual. Carno implied that KFKA’s Oliver agrees with her that abortion issues are a distraction in the recall election. Regardless, Oliver owes it to women–and the rest of us–to air out why it’s not a legitimate topic to discuss. 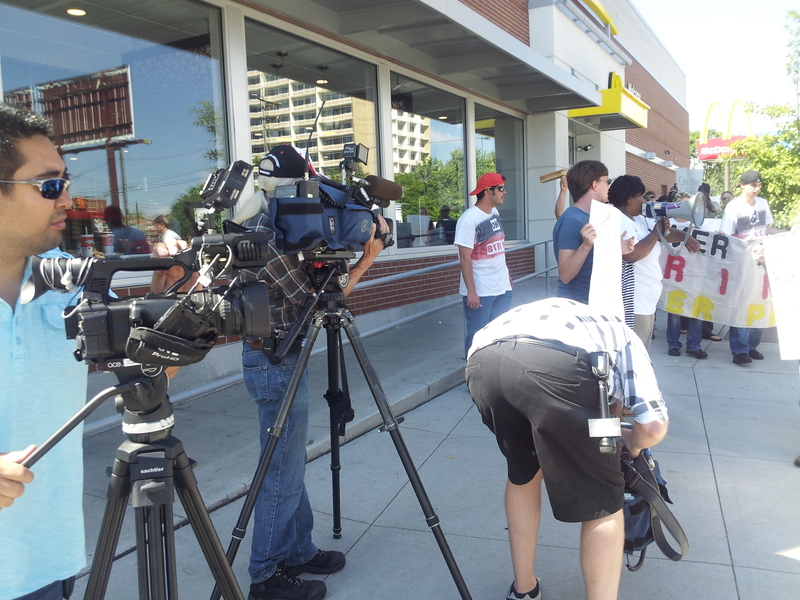 If you’re one of the organizers of the strikes at Denver fast-food restaurants today, you got to be feeling pretty good about the media coverage. 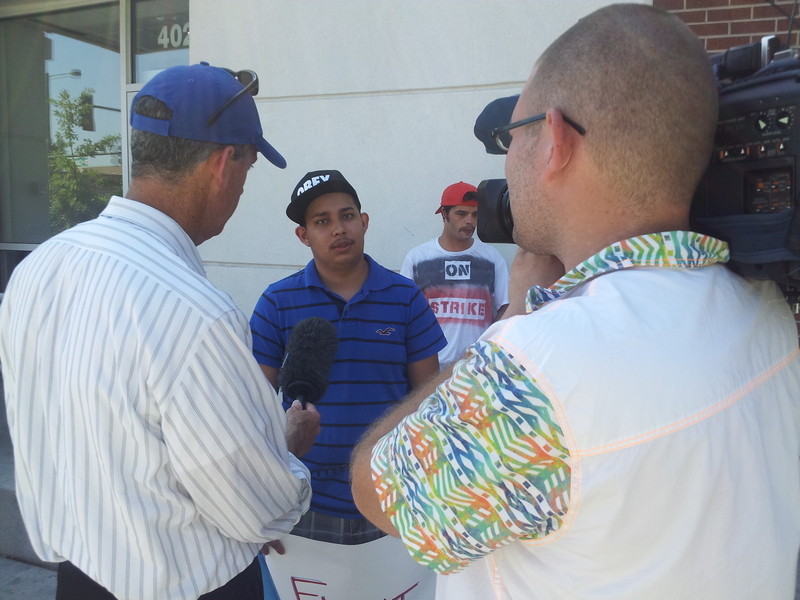 Unfortunately, worker demonstrations aren’t normally hot news items, unless it’s an NFL players’ strike or something, but today’s walkouts at MacDonald’s, Subway, Pizza Hut, and Taco Bell were a media home-run here in Denver, like they were in cities where strikes occurred earlier this summer. Strikes were scheduled in about 50 cities today. A sample of local coverage includes KUSA 9News, KMGH 7News, KDVR 31, The Denver Post, and KOA radio. You can’t attribute the media interest to the August doldrums or to the good feelings after yesterday’s coverage of the 50th anniversary of MLK’s march on Washington. High-impact visuals? Nope. Funny chants? Hey, hey, ho, ho, no. Overwhelming numbers? Nope. A media bias toward worker organizing? (cough). So why the media interest? Journalists responded to the notion that this would possibly be the largest nation-wide strike by fast-food workers. Their simple demand of a raise to a minimum of $15 per hour, about double the current hourly wage, is engaging. And (somehow) it seems fresh. These are the people feeding near the bottom of big capitalism at a time when big capitalism is scary big. Their plight (and bravery) resonates, objectively, even if you oppose it. It’s a good story. Given the fragile recovery of the economy, it looks like avoiding a government shutdown is way up there in terms of important news stories in the coming months. The stakes are high, and everybody is invested. So utterances by Colorado’s congressional delegation on the topic should catch the ears of reporters, especially if such utterances sound particularly extreme or intransigent. That’s how Rep. Cory Gardner sounded during an Aug. 23 radio interview on Greeley’s KFKA radio. He acted as if he’d do whatever it takes during the budget process to defund part of Obamacare, and then Gardner said he’d look for ways to defund the mandatory parts of the program later. Negotiations didn’t seem to be on his radar screen. Gardner: If we’re going to have a Constitutional republic that embraces three separate but equal branches, the legislative branch, regardless of who is in power, regardless of whether their party is in the White House or not, has to assert their authority and say, ‘You know what Mr. President, I’m sorry, not only no because it’s bad policy, but no because you don’t have the right, power or ability to do it. And that’s what we’ve got to stand up and do. Obviously the Senate is obviously going to think otherwise on this. I wish they wouldn’t. Media omission: Will Republican state chair be scolding Pueblo GOP county chair? A couple years ago, GOP Chair Ryan Call suggested that Sarah Arnold, who was an El Paso County GOP Secretary, resign because Republican office holders are not supposed to publicly criticize Republican policies–or favor one GOP primary candidate over another. Pueblo County GOP Chair Becky Mizel should be hearing from Ryan Call soon, if he’s consistent, because Mizel showed clear support for Tom Tancredo during an Aug. 16 radio interview. At least that’s what I take away from this discussion among Mizel, KNUS’ Peter Boyles, and Jennifer Kearns, who’s a spokesperson for the recall effort. BOYLES: Huh-uh. Tommy is the red-headed stepson of the Republican party, and all three of us know it. They just wish Tom would go away. I mean, that’s the truth. You know it. I know it. Becky knows it. I think smart people listening to this radio show wish – I mean, they believe,– not believe, they know the Republican Party of Colorado would just as soon Tancredo go soak his head. MIZEL: Well, the same goes for Ted Cruz and Ted Cruz isn’t going to go away. MIZEL: So, you know, it’s — I think you do have to take it over from the inside. You’d think that Mizel, who’s found herself in the media spotlight due to the attempted recall of State Sen. Angela Giron, doesn’t like Ryan Call much, given that she wants to take over the state GOP “from the inside.” And she’s certainly not scared of him, as she’s violating rules that Call clearly supports. Arnold: Ryan Call is perfectly consistent in his inconsistency. He arbitrarily and capriciously applies the by-laws as it suits him (for example, it’s okay if he contributes to a Democrat while a party officer, which is a clear violation of the by-laws, but not okay for someone to have a policy disagreement with the House Majority Leader while a party officer, as in my case–a topic on which the by-laws are silent). In fact, he’s happy to change the bylaws so he could endorse Romney for President, an unprecedented act. The irony would be even more incredible since many Party officers (including Ryan) turned a blind eye in 2010 to the numerous endorsements of Tancredo as a third party candidate made by other party officers across the state, if he were to choose to pursue removal for mere comments about a candidate that don’t appear, to me at least, to be an endorsement. That’s what Rivera told KZNT talk-show host Derrick Wilburn Saturday. Wilburn should have asked Rivera if he’s ever noticed that guns aren’t the only topic discussed down at the Capitol. Actually, it’s next to impossible to keep track of all the different issues, including abortion issues. It’s silly for Rivera to say that the election of any state senator is about one issue. That’s not how representative government works. Wilburn knows this, and he almost certainly saw, at least, that Texas passed one of the nation’s most restrictive abortion laws just this year. So, he should have asked Rivera what he was thinking. State Sen. Vicki Marble went on KLZ’s Grassroots Radio Colorado Friday to discuss the controversy over her comments about the eating habits of minorities. Radio is a particularly good medium for someone to explain a botched public utterance, but the radio hosts put zero effort into eliciting a meaningful explanation from Marble. Co-host Ken Clark: What do you make of all the controversy? Marble: Well first, good afternoon everyone. It’s a pleasure to be here. And the controversy, I am excited. We are getting this dialogue going. I mean, just let it run because we are coming out with the real medical research that will show that yes—but you know, I don’t care about who says what. And I want no apologies. I just want people to have the chance to get the education on their genetic predispositions to certain diseases, and if they choose to change their diet in order to keep their quality of life, then great! And if not, it’s their choice. But at least they have the information out there that will help them make an informed decision. Marble: You’ll lose your job. And if it is cancer or heart disease, it’s very possible that your medical costs will drain, very quickly, your assets, your life savings, and you may even lose your home. And you could be poverty-bound forever, because it is very hard to get out of the poverty level once you’re in it. And if you have a life-threatening issue like heart disease, diabetes, cancer, you are, I guess, you are chained to it. You are a prisoner to your own health. And if you have a predisposition in your family, you should know about it. You should at least have the information and eat accordingly. And we always see these advertisements on TV and sound bites on the radio about our health, and eat healthy. That’s what we’re talking about. At least, know what you’re up against. Know what some of those quiet shadows in your health history may be, and live accordingly, if you choose. I’m not up for legislating anything about eating. It’s just getting the information out there. ..
Clark: …Where does this go from here? … Let’s quit screaming racist. Let’s have the conversation. Clark: You can have your Big Mac. You can have your Big Gulp. Marble: [laughing] You can have all that in moderation, but eat a couple fruits and veggies on the side, and just be aware. But it’s your choice. KVOR talk-show host Jeff Crank said on-air Saturday that it’s impossible for GOP recall candidate Bernie Herpin to favor personhood, as claimed in a TV advertisement by Herpin’s opponents. Crank raises his voice on his Jeff Crank Show as he explains why, citing evidence provided by the folks who made the anti-Herpin TV ad. Crank: In the Pike’s Peak Citizens for Life survey, Mr. Herpin indicates that he believes that life begins at the moment of conception. In the same Pike’s Peak Citizens for Life survey, Mr. Herpin was asked if he supported a ban on embryonic stem cell research, and he marked ‘no’. Mr. Herpin’s opposition to a ban on embryonic stem cell research is in direct conflict to the claim that he supports the personhood amendment. He doesn’t support it, okay? Sorry, Jeff, but Pikes Peak Citizens for Life actually asked Herpin, “Will you lead federal and/or state efforts to ban embryonic stem cell research.” Herpin answered no. Herpin’s concept of personhood is also consistent with his statements in the survey that the court, in Roe v Wade, did not have the authority to “declare the pre-born as non-persons” and he would not appoint anyone who supports Roe. Add to this Herpin’s agreement with the statement in the Pikes Peak survey, fashioned by an outfit that endorsed the personhood amendment in 2010, that the government does “not have the authority to declare any part of the human family to be non-persons,” and you have to conclude that Herpin supports personhood. Maybe he’s changing his mind now, as Ken Buck and others have done before him, but it’s reasonable to say Herpin’s answers to the questionnaire show support for giving legal status to zygotes (fertilized eggs), thus, as the anti-Herpin ad points out, banning common forms birth control and interfering with many personal decisions. Given the evidence, Crank should stop asking his listeners to pester Colorado Springs TV stations to stop running the anti-Herpin ads, as he did on Saturday, and he should stop promoting his own complaint trying to get TV stations to do so. Already, Tim Larson, general manager of KRDO TV has reportedly decided to keep running the ad, apparently sharing my view that it’s factual. WORLEY: It’s not a good idea. But there’s nothing –. It’s in-artful, and yes, you’re opening the door for an opportunist like Rhonda Fields, because that’s what she is. PETTY: Yeah. I agree with you. WORLEY: I said it! I said it! Her son died. She’s a victim. Diane Primavera in Broomfield ran on a “I’m a cancer survivor”. WORLEY: Good for you. Move on with your damn life, and actually show that you can legislate some stuff. PETTY: Well, and everybody in their life, I mean, granted, those are horrible challenges to have, but everybody has a significant challenge in their life that they overcome at some point. In general, it makes them a better, stronger person. They’re there for other people. They don’t use it as a coattail to ride their way to reside under the Gold Dome. WORLEY: And it’s some! And it’s some! It’s not – I know skinny African American and I know athletic black Americans. I mean, –. PETTY: Yeah. But that one always drove me crazy. It was – was it inappropriate to say? Absolutely. WORLEY: It was just dumb. WORLEY: Rhonda Fields! For some reason, I get –. WORLEY: “Rap-Sheet” Rhonda! Looks good in orange! Oh my gosh! [facetiously] That’s racist! PETTY: And wait! Tell the listeners why she’s called “Rap-Sheet” Rhonda. WORLEY: She was arrested. – Why I call her “Rap-Sheet” Rhonda –it’s not a black thing, it’s an orange thing. She was actually arrested for shoplifting, I believe. WORLEY: Look, that’s what she is. She has a criminal record and you geniuses elected her! Coffman: And one thing that I certainly read from viable sources is that a lot of the research that’s being done—when you put your application in to get a grant, if you don’t submit to the, you know, orthodoxy of climate change by the radical environmentalists, you’re not going to get a grant. Rosen didn’t ask Coffman for the specific “viable sources” Coffman read on climate-change research grants, or whether Coffman thinks the National Science Foundation, for example, a major provider of climate-change research, is in the pocket of radical environmentalists. To his credit though, Rosen asked Coffman at the beginning of the interview, “How come you’re not doing anything publicly to defend yourself?” But Coffman ignored the question, choosing instead to attack the League of Conservation Voters, which paid for the ad. Coffman went on to contradict his previous statement, quoted in the ad, that it’s “subject to debate” whether humans are causing global warming at all. Coffman: My view is that it’s naturally occurring, number one. But certainly man-made activity influences it at the margins, and I think it’s debatable how much that is. But certainly, you know, we know that carbon emissions are bad, and we ought to do everything responsible to bring them down in a balanced approach between environmental concerns and economic concerns. Rosen failed to ask why Coffman had changed position slightly on global warming, now saying there’s human influence “at the margins,” or whether he’d misspoken on the radio show. Rosen didn’t ask, after Coffman said “carbon emissions are bad,” why Coffman voted for a measure just last year that would have prevented the EPA from regulating carbon emissions. It was supremely ironic that Coffman invited outside money into Colorado to support him, after he’d just criticized the influence of out-of-state money, but Rosen didn’t burp out any sound of surprise. Neither did Rosen ask whether Coffman is worried that his extreme position on global warming won’t mobilize out-of-state conservatives but instead will affect soccer-mom environmentalists whose kids play at the Aurora Sports Park. Rosen said on-air that he and Coffman are “friends,” and Rosen admitted that he’s “biased” toward Coffman. It showed in this interview; that’s for sure. I’d like to think Rosen could do better. View the League of Conservation Voters ad here. LCV released a second ad today. Follow Jason Salzman on Twitter @bigmediablog. Devon Lentz and Tom Lucero are KFKA talk-radio hosts and also former Larimer Country Republican officials. Lucero was a CU regent. So you have to admire them for not pulling their punches when discussing state Sen. Owen Hill’s statement, from an email, that Hill is the only GOP candidate that Sen. Mark Udall fears. Lucero: Think about this, Devon. You’re a 31-year-old. You’ve just been elected to the Colorado State Senate, and you’re feeling so good about yourself you decide to run for the U.S. Senate…. You announce for the U.S. Senate and you come out and bash all of the Republicans who are running in the Republican primary, one of whom is Weld County’s own District Attorney Ken Buck, who actually won the Republican nomination two years ago in a U.S. Senate race and barely lost to U.S. Sen. Michael Bennet by I think 33,000 votes. Lucero: We are talking about Owen Hill, State Senator out of El Paso County…. He was so bold as to say, I am the only candidate Mark Udall fears in the Republican primary. Lentz: All right. When I read that, I didn’t read any further, because I don’t care to read about someone’s inflated ego. So I stopped reading at that point. But I remember a couple of years ago having a conversation with you, and I said, “What is WRONG with this individual?” And you said, “It’s that bug you get bitten by when you realize you are an elected official but then eventually you get better and then you realize that you’re still human. Lucero: MOST elected officials get better, not all of them. Some of them think they are President of the United States…. Lentz: So all I can think is Owen has gotten himself bit numerous times. And like I said, I had to stop reading the article after the first statement because I was like, wow, is ego is so in the way. Lucero: Everybody kind of laughed at him. It was fun, because Mark Udall’s campaign laughed at him. Ken Buck’s campaign laughed at him. He had the audacity, when asked about Randy Baumgardner, to say, “Randy Who?” He’s a little full of himself. I don’t mind ego. I don’t mind confidence. But when you have arrogance — there’s a difference between having a healthy, a.k.a., Tom Lucero, Devon Lentz, versus being arrogant Alex Rodriguez of the New York Yankees, where you’re posing in front of the mirror…kissing himself… How to Win Friends and Influence People. Owen Hill needs a copy…. You are currently browsing the The Big Media Blog weblog archives for August, 2013.